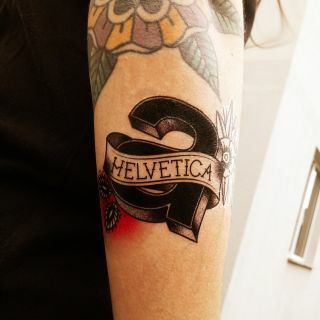 Brazilian graphic designer Will Jr shows of his love for typography with these font themed tattoos. Getting the right tattoo takes a lot of planning. You want a design that communicates something unique about you, but not something so niche that people can't appreciate it and swoon appropriately. On the other hand you might want to stay clear of a generic anchor or a heart with a 'mum' inked inside with tacky calligraphy fonts. If you're still scratching your head over the perfect tattoo, Brazilian designer and letter-enthusiast Will Jr might have just the look for you. Channeling his love of fonts and old school tattoos, Will Jr has created a set of temporary body art designs based on popular wordmarks. "Like almost all tattoo lovers, I'm a great fan of old school tattoo artworks," says Will Jr, "the simplicity and precision in each line, the way to draw something simple but at same time with a lot of details and ideas behind the concept blows my mind and inspires me a lot. Old school tattoos always show me the simplest and beautiful way to illustrate an idea." The detail is beautiful, but we can't help but think that Will Jr has missed a trick by not writing the font names in the relevant typography set. Nit-picking aside, this is a fun set of designs that you won't have to live with forever. Check out the full collection below and see them in action on Will Jr's Behance page.